In my last post I shared the story of our mismatched lamps in the master bedroom and gave you a peek at my DIY industrial nightstand. Today I thought I’d share the transformation. It’s nothing dramatic, just a quick, easy and inexpensive upcycle. We only had one lamp and nightstand in our new master bedroom, and really needed to add more light, so we decided that a new nightstand and lamp would be an easy fix. We’ve always been a “one lamp in the bedroom” kind of couple. Maybe that’s weird, I don’t know, but for one reason or another I’ve always had a nightstand and a lamp and the hubs has always had a small pedestal and his clock. We don’t have overhead lighting in this room so this arrangement wasn’t working for us. To remedy that, I began the search for a new nightstand and lamp. I was able to find a lamp but had a bit more trouble with the nightstand. I looked online and scoured estate sales and thrift stores but couldn’t find anything I liked in the size I needed. Then I spotted this vintage typewriter cart under a bunch of heavy boxes at a thrift store. We could use it for a nightstand (until I could find a proper one that fit our space). I took some measurements and it was just the right size, a bit on the short side, but otherwise a perfect fit. I have no clue what I’m going to do in the master, so I decided that I would paint the “new” nightstand gloss white to keep things easy. A couple of quick coats and it was ready for it’s new life as a bedroom nightstand (for now anyway). It’s different and quirky and a nice change from all of the wood. The hubs is happy with the change too. I mean…I think he is, but you never know. Now we are a “2 lamps in the bedroom” kind of couple. 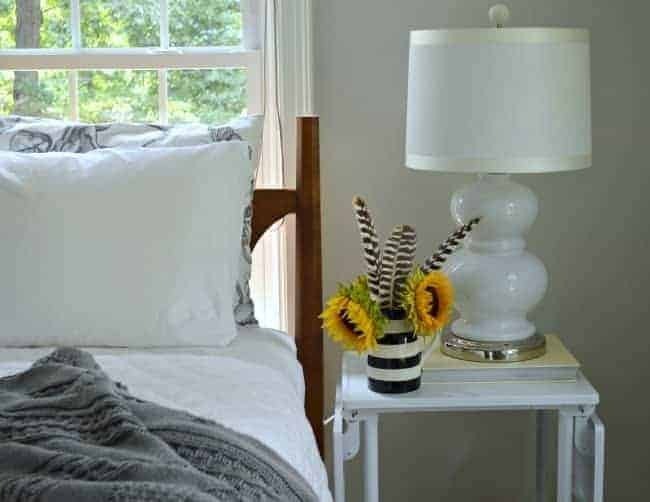 Check out my tips on creating a cozy bedroom for fall, here. Previous Post: « Bedside Lamps: Should They Match? 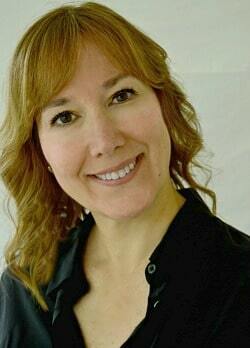 Very nice makeover Kristi! 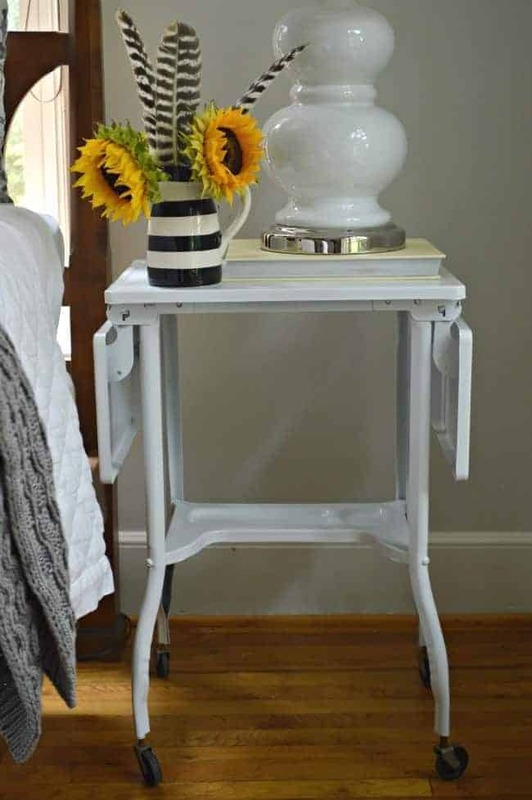 Love your nightstand and the white is very pretty. 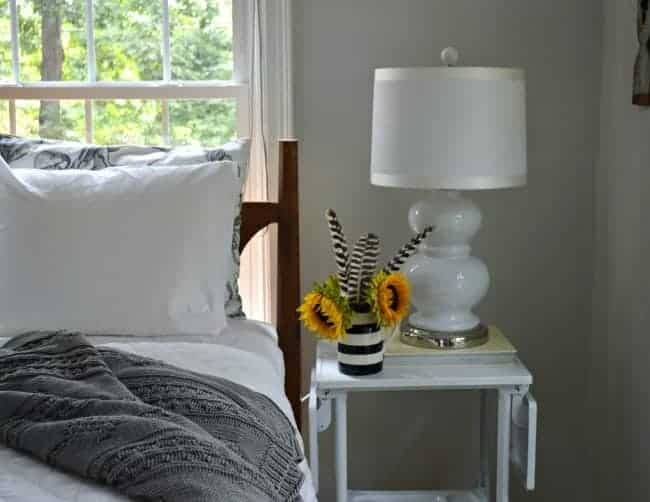 Love your black and white striped vase with the feathers too. Cool I’ll have to be sure and check that spot out next time I go to target. I didnt realize they had such cute things there. 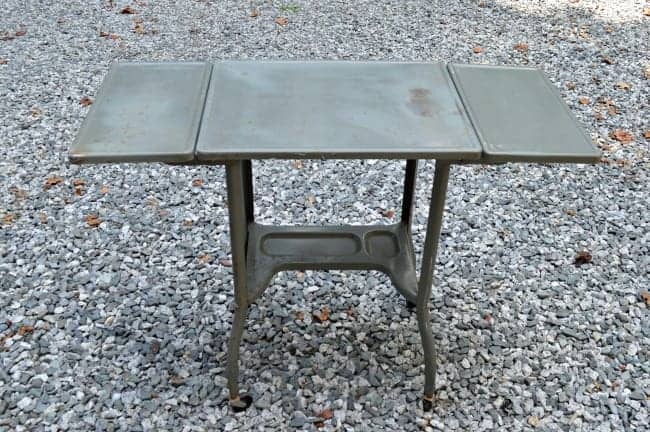 The great thing about an old typing table is that you can use it anywhere for anything; portable sewing machine, bar cart, coffee station, craft table, you name it. And with the leaves up, it gives you a bit motr space. I like the glossy white. I have an old gray one in storage; it might be getting a coat of paint! I love this Kristi & it has a shelf underneath, so that’s handy! Love the makeover too! Especially the white paint, which goes with everything. There’s no way I could make it in our bedroom without 2 lamps. Visiting from the Challenge. Pinned. Gorgeous! I love the white! It’s so crisp! I love the nightstand Kristi! Mixing industrial and wood is one of my favourite things to do… it’s like Farmdustrial 😉 Thanks so much for linking this up to our Inspiration Galore Project Party last week. 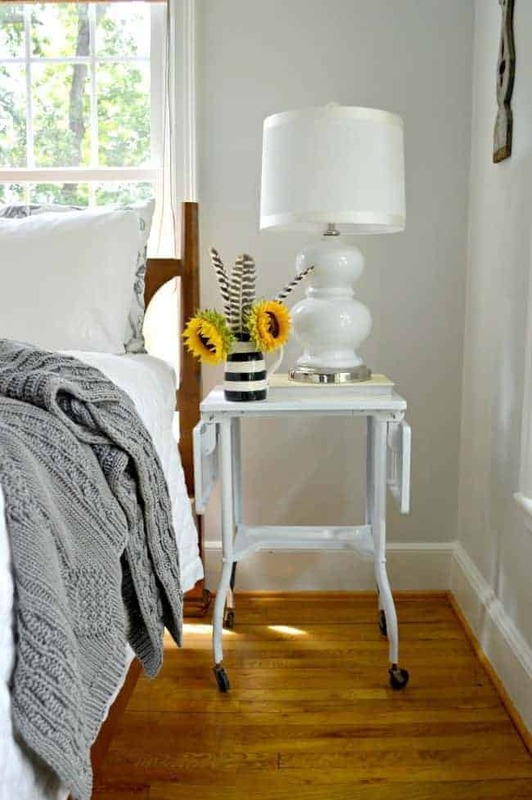 wowsers your bedroom looks so crisp and clean and the table is adorbs!!! Nope, lamps don’t need to match! SO much more personality!!! 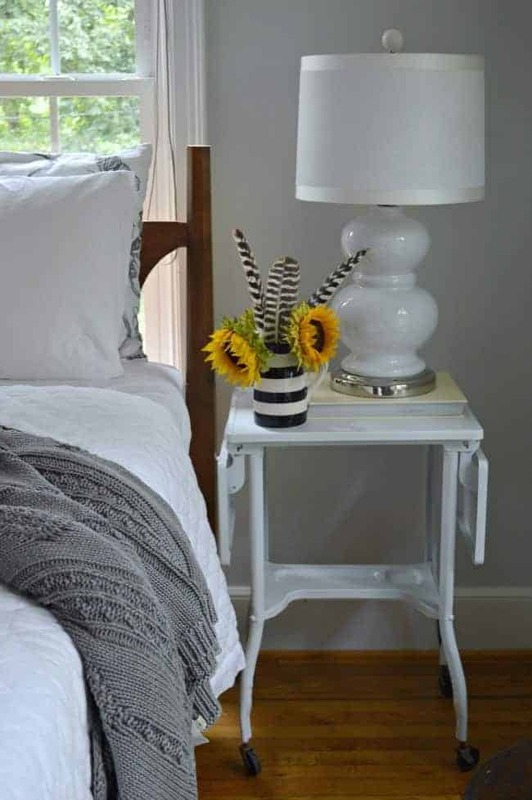 Love the nightstand, Where did you get striped vase, love it and have been looking for one for a long time. Thanks Linda! I got the striped vase from the Target Dollar Spot about a year or so ago. call off the dogs!! i love your nightstand and would say your hunt is over. it looks way cute!…. Beautiful as a bedside table, I wouldn’t change a thing! Love your great ideas!Very good job!have fun! Thanks for sharing the idea! Thanks so much, Eleni. Hope you have a great holiday weekend! I would like to receive your email,please.thank you! HI Eleni. If you would like to receive my updates, just fill out the box at the bottom of the DIY Industrial Nightstand post (there’s also one in the sidebar) with your email and you should get a welcome email in return. If you have any issues with it, please let me know. Hope you have a great weekend! Love the nightstand,color and the price. Good job, thanks for sharing. Have fun with the daughter,I always do. I’ve only been to Asheville once and it was several years ago so I was excited to go back. Hope that you had a great weekend! Awww, thank so much! I’m happy with the way it turned out. 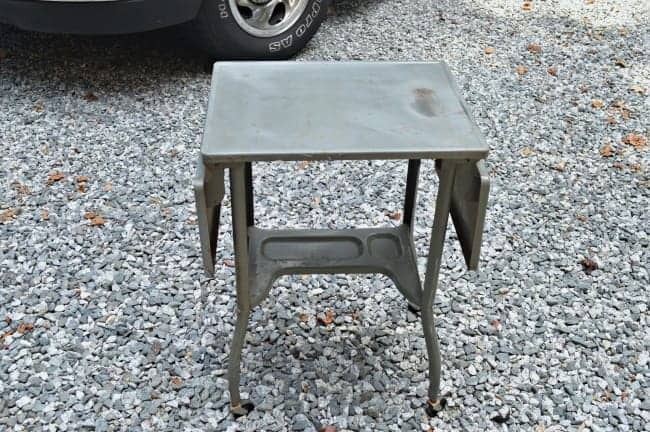 That is an awesome piece…great find!! It looks super in the space, too! LOVE that little table! Wish I could find one. Would you share the paint color on your walls in the bedroom? Thanks so much, Linda, I appreciate it. The color on my walls is Benjamin Moore Gray Owl, at 50% strength. The bedside table looks great. Amazing what a couple of coats of paint will do! Enjoy your time with your daughter and Asheville is a great place. Lots of quaint shops, I’m sure you will find a “buy”. The Biltmore Mansion is a must too. Thanks Brenda! We really enjoyed our visit to Asheville. We were only there for 24 hours so we didn’t get to do everything we wanted, but we’ll definitely go back (Biltmore is at the top of my list for the next time). Hope you had a great weekend! I love the new nightstand. I wouldn’t even consider looking for a replacement. It looks light and it’s “not wood”. I also think your lamps are pretty. I have had mismatched lamps in the bedroom for many years. I love your lampshades. They are beautiful and perfect with your lamps. I truly enjoy your postings! Enjoy Asheville, I was there twice this summer. Love, love, love that city! If you like chocolate, make sure you check out French Broad Chocolates for liquid chocolate truffle and and other unique things!! Thanks Melanie. I love Asheville too and I enjoyed touring it with my daughter. Thanks for the tip about French Broad Chocolates. It just so happens that it was the first shop we went into. Yum!